CreativeMornings’ global theme for March was Hidden. At the Chicago chapter, Artist and Designer Matthew Hoffman discussed his tendency to hide from his creative output—by shining the light on the ideas, not himself. The “thing” that Hoffman does not typically do is attaching his name to what he makes. This is apparent when he launched his self-initiated You Are Beautiful campaign, which he highlighted throughout his talk. No one knew who conceived it when it was launched and gained awareness worldwide, because Hoffman did not give himself credit. As the You Are Beautiful campaign ascended, its creator remained silent, taking the on-the-bench view of observing his project’s reception and its gradual unfolding. His rationale for divorcing his name from his project was to allow You Are Beautiful to thrive on its own merit, without identifying it with its origin. Ultimately, the popularity of the You Are Beautiful project steered over time toward the revelation of its maker, and Hoffman was discovered. In the Harry Potter series, there was a legendary object called “the cloak of invisibility.” I assume Hoffman would covet this item. His choice to be invisible—while his work remains visible—was iterated throughout his presentation. A huge part of him leans to invisibility in connection with his work. 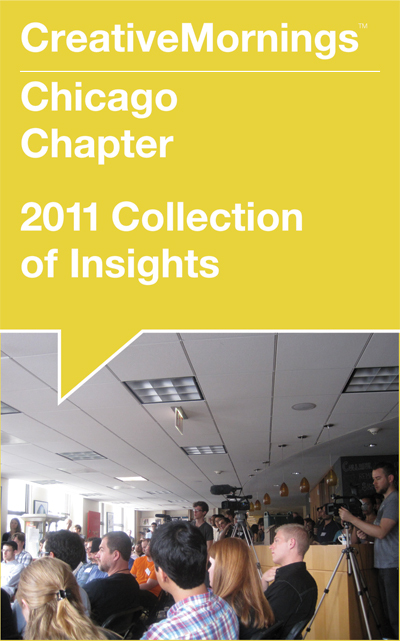 Another is open to visibility (as demonstrated by his appearance at the Chicago chapter of CreativeMornings). Considering Hoffman’s habit of toggling between hiding and revealing himself in his work, I asked him afterwards, what compelled him to do his talk. He affirmed that CreativeMorning’s global theme of Hidden was one that was totally relatable to him. My hidden reaction: Duh! What it means to be hidden (with making) was painfully obvious to him, but not to me (who, like many, marries my name with what I make). Hoffman’s work-dynamic comprising the position of hidden and the position of exposure is a contradiction. The former is a strain of selfishness. The latter is selflessness. It was expressed by Hoffman that “It’s selfish to hide.” This depends on what is being hidden. In Hoffman’s case, he desires to hide his name in his work, yet his point of view—a significant reflection of his name, his identity—is not hidden in his work. This internal vibration between the hidden and the visible is layered. From one angle, it’s backwards to not put your name on something that you’ve worked hard on. From another, it’s humbling to work without the anchor of authorship as an anonymous gift to the world. If there’s an apparent contributor vying for the topmost level in Hoffman’s creative process and its fulfilling results, it would be his contradiction revolving around the hidden. 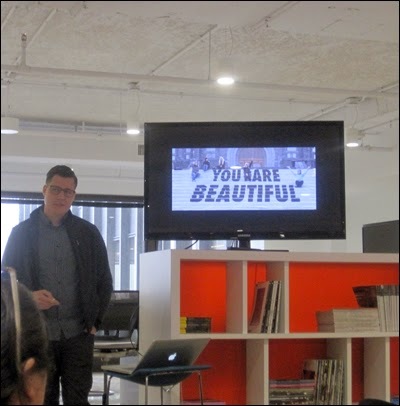 Big thanks: to Cannon Design—for hosting—and Steelcase for sponsoring Chicago CreativeMornings #28; to organizer Kim Knoll and operations manager Kyle Eertmoed of Knoed Creative, who spoke at Chicago CreativeMornings #7, and to the Chicago CreativeMornings crew for their volunteer work in making CreativeMornings happen in Chicago. Typeface of quotes is Helvetica (1957) designed by Max Miedinger with Eduard Hoffmann.